Want to know my current nail obsession? White nails. It all started with a few coats of Essie Fiji (swatched) a few weeks ago. I've been gaga for the clean, refined look of white (or white-ish) nails. They look modern and fresh and can instantly make you look a bit more tan. The downside is that I find they can look lackluster and dingy pretty quickly (even before any chips have emerged) so they do require a bit more maintenance. Still, I'm loving my whites. Read on to see my current favourite and how I made that little bit better. 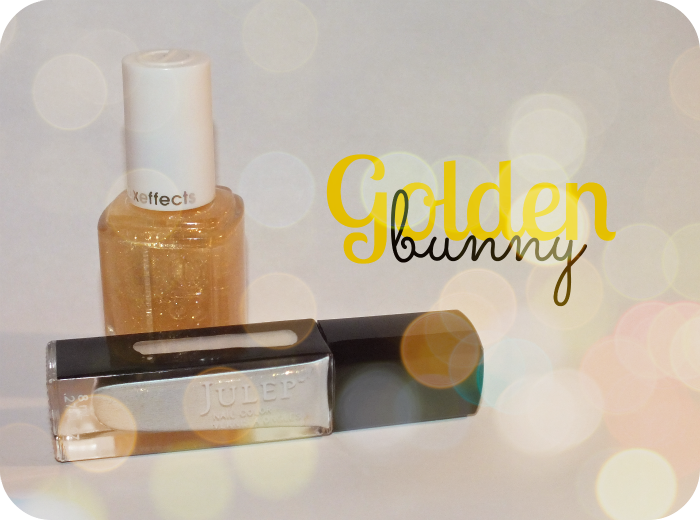 Bunny is described as being a 'crisp white linen with fine gold shimmer'. Sounds pretty, but there is one little problem- the gold shimmer. What do you mean? You can't see it? Me either. The delicate shimmer that Juelp shows just isn't there. You can just barely see it in the bottle but what is there doesn't translate on the nail at all. All that aside, the formula of this is pretty fan-bleeping-tastic! White polishes can have horrendous formulas, but this little guy is creamy and smooth. It's a bit thick, but two coats give you white polish perfection. 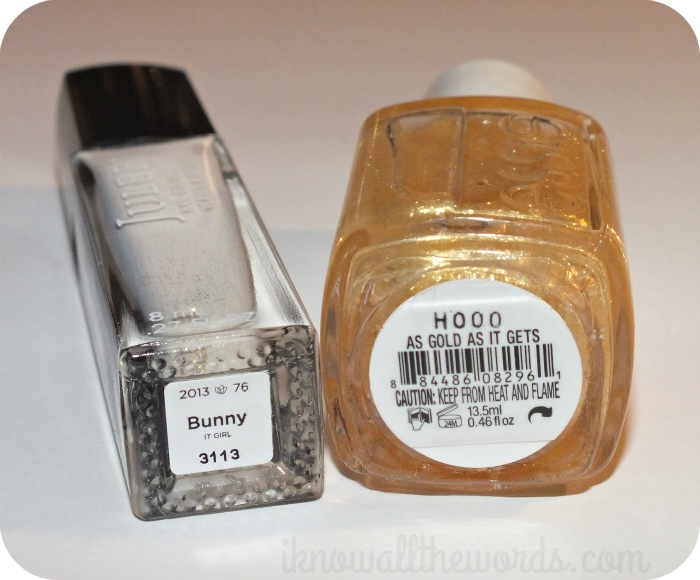 As much as I do like the crisp, clean look of Bunny on it's own, I had a hankering for gold, so I topped it with two coats of Essie As Gold As it Gets. I'll admit that I had to specifically go get it because I passed it up when the Luxe Effect collection first came out, but it is a really gorgeous top coat. The gold flakes in it are really fine and give a subtle glitter. Perfect combo! What are you currently loving on your nails?